Bore-rain? Not this time, the Bahrain GP was surprisingly exciting and action packed, especially after the safety car period. Mercedes have still led every single lap in 2014, but that doesn’t mean the race is dull, and Bahrain definitely wasn’t. Hamilton won his second consecutive race, Rosberg finished on the podium for the third consecutive time and Sergio Perez returned to the podium for the first time since the 2012 Canadian GP. Nico Rosberg won the fastest lap, just 0.088 faster than Hamilton. Hulkenberg set the third fastest lap but was over 1.7 seconds slower than Rosberg. For the first time this season Valtteri Bottas didn’t gain places in the race, after starting third and looking likely for a podium he finished only 8th. Daniel Ricciardo gained the most places in the race, gaining nine positions. Mercedes already have 111 points in the Constructors’ Championship, over double what they had at this point last season and over 30 more points than Red Bull did after three races last season. Nico Hulkenberg hasn’t yet finished any higher than fifth this season, but is third in the championship thanks to consistency and reliability. 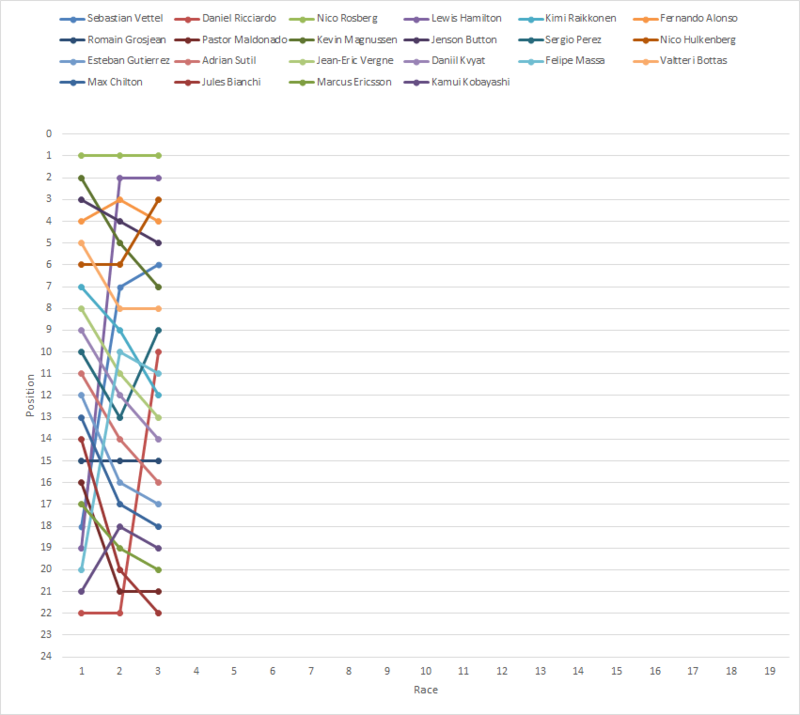 There are too many changes in the Drivers’ Championship after the Bahrain GP to list, so the graph will have to do! At some point I will add driver helmets to the graphs to make them easier to read too. 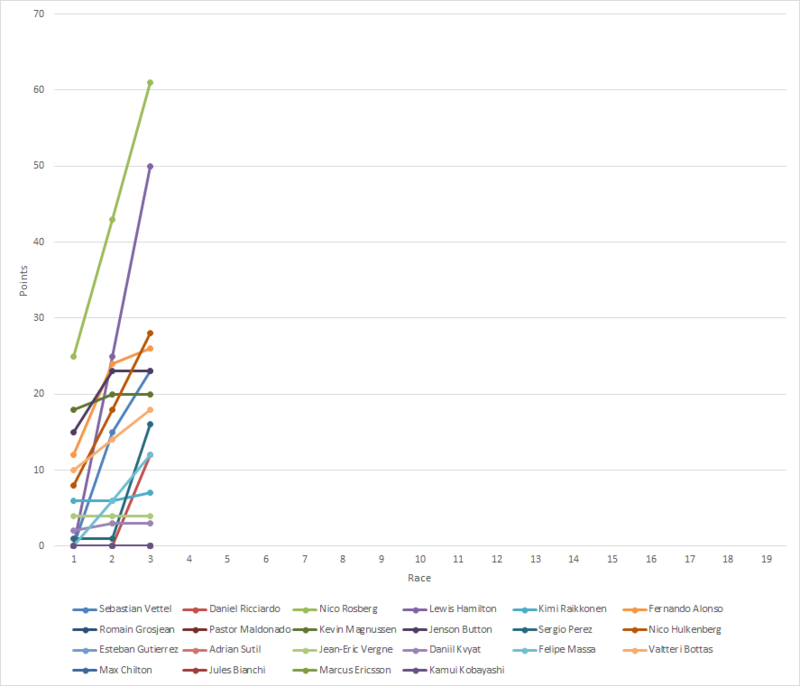 This graph really shows the massive advantage that Mercedes have, Nico Rosberg has over double the points of any driver other than his teammate, hard to see anyone other than Rosberg or Hamilton win the title, but anything could still happen.